Bandit was surrendered to a California animal shelter in the fall of 2016. The shelter was at capacity and due to Bandit’s abundant energy and intelligence, he was struggling in the kennel environment. Shelter staff saw Bandit’s potential and submitted him to Rescues 2the Rescue. A network of R2R and Working Dogs for Conservation staff and supporters came together to help Bandit manage his kennel stress. 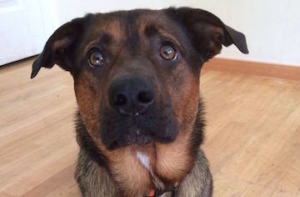 A partner in California offered to foster him and while with her it became clear he needed something special but a life as a detection dog was probably not his best fit. The staff of Carroll College’s Anthrozoology program heard about Bandit and his loving and dedicated foster volunteered to drive him all the way from California to Montana. Bandit has been permanently adopted by an Anthrozoology student who will train him for a variety of tasks. Before school even started, he learned to detect clove oil and was working on ammunition; he was also mastering an assortment of basic obedience skills and service tasks. Once school starts he will take an array of training classes including advanced obedience, agility, and possibly even human tracking. When Bandit first came home, he would jump on counters and people, play-biting whenever anyone tried to pet or play with him. He would put anything and everything in his mouth and refuse to give it back. Bandit has since learned how to settle down and relax – he actually naps now, a feat his adopter once thought to be impossible. As a “college student”, Bandit’s classes will help him continue to focus his boundless energy and grow into the amazing potential all his supporters saw in him from day one. 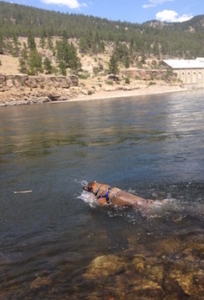 Most weekends Bandit can be found hiking and swimming (in warm weather) in the beautiful mountains of western Montana or flopped over on his back chewing his favorite toy, an empty peanut butter jar. In the rest of his free time he works as a watermelon connoisseur, aspiring lap dog, and provider of a free belly for rubbing to all who meet him – with no more play-biting. Bandit’s transformation from an ill-mannered troublemaker to a polite, skilled, and well-adjusted dog has been amazing to see and he will continue to grow, learn, and improve in his forever home. Curious how Bandit is doing in school? Follow his progress on his very own Facebook page!